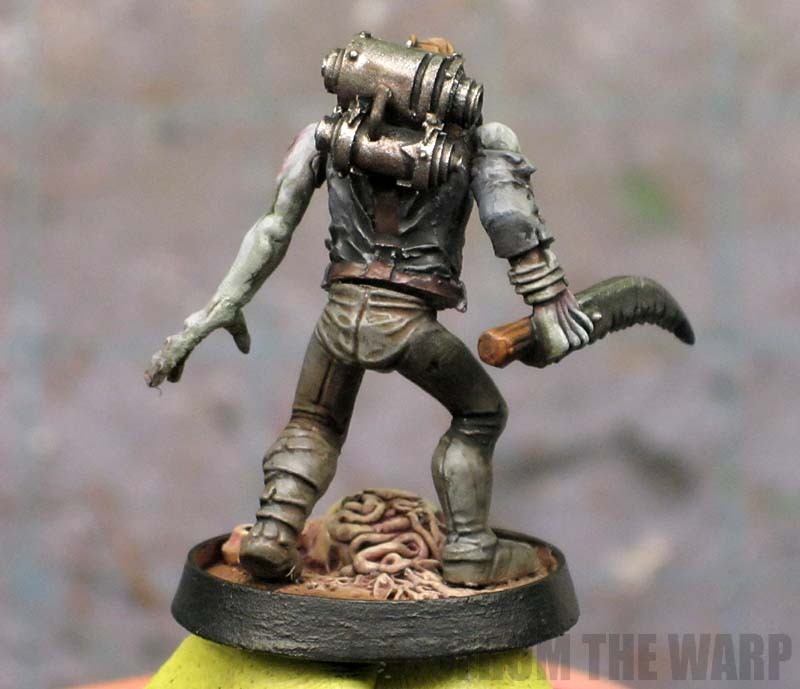 When I saw that Chaos cultists were part of the new boxed set, I was so excited. 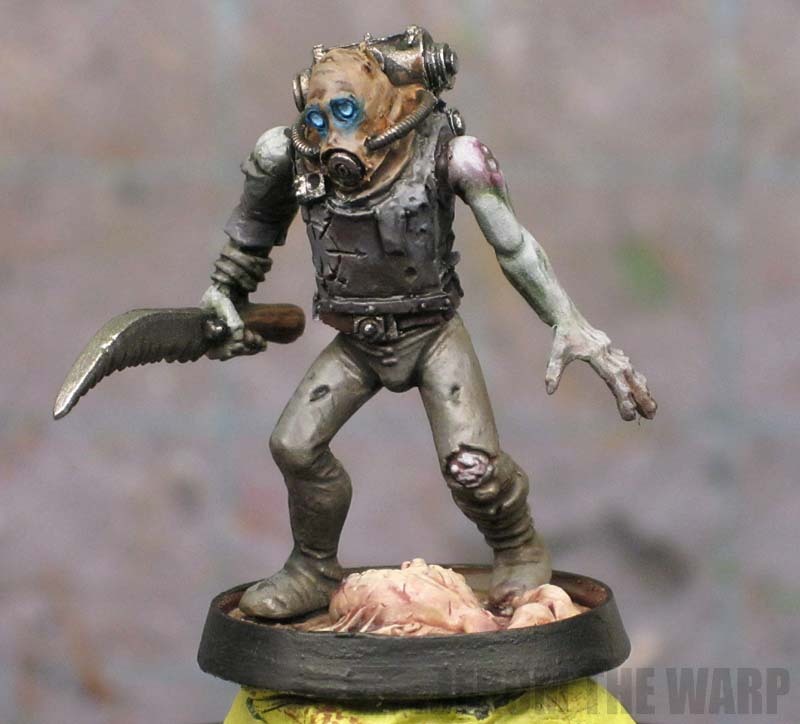 These guys offer so much variety in terms of conversion and painting possibilities. You can't mess these guys up. It's almost impossible to do a bad paint job on them. I love those kinds of models. Stick with the grim dark theme and they all but paint themselves. A while ago, I happened to stumble across someone selling a handful of zombie and Forge World bits at one of my FLGS swap meets. Without thinking twice, I picked them up. I had no idea what I was going to do with them since I don't play Chaos much less have an army, but they just oozed coolness. I had to have them. Besides, the price was right. And they've sat patiently on my desk ever since. I knew I'd paint them one day when I got the chance. And that time is now. I'll be honest, this guy is not going to win any awards, but he was an absolute blast to paint. Took me no time at all either. 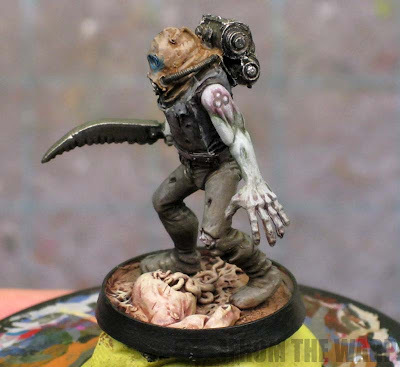 Primed him light grey, base coated him with a handful of muted colors I pulled out and then washed him liberally with a handful of shades at the same time so they bled together. Once he dried, I went back in with the original base colors and used them as a quick highlight in a few key spots. Done. As a rank and file guy painted to a quick tabletop standard, he's spot on in my opinion. Nothing fancy at all for your basic troop model. I did splurge and gave him a Nurgle marking on his left shoulder and make his eye lenses look like they were glowing. I did however pick up these particular bases just for this squad, they were a must have for this unit. They come from Secret Weapon minis and are perhaps the nastiest looking bases I've ever seen. All kinds of body parts and guts all over the place. They are the Corpse line I believe. Quite fun to paint up too. It just goes to show you that you don't have to use a million colors and all the fancy tips and tricks in the world to come up with a perfectly fine looking model. This guy is a half dozen colors and five washes at most. Most importantly of all, he was fun to paint. I wasn't worried about how this part or that part was going to turn out and if my client was going to like him or not since he was just for fun. Sometimes it's good to paint and just enjoy yourself. I think I'll finish the rest of the squad now. 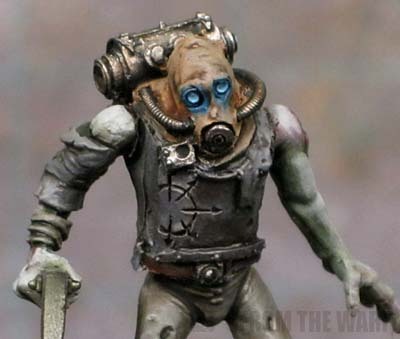 Nice conversion, I was having thoughts of how to convert something to fit the Nurgle them. You hit the nail on the head. Even your 'rank and file' paint jobs are exceptional. I'd love to see you try a Golden Demon standard paint job somethime. Id love to see a guide on painting that scheme! It's perfect for imperial guard - any chance you could follow up with more detail on the shades/paints used and how you achieved those lovely subtle tones. Nice use of a limited palette. Looks like I know what I'm doing for my DV cultists...Thanks! The boils forming a mark of Nurgle are a fantastic touch, you have to do more of those on other squad members. I plan on doing a couple of posts on the painting process. One on the colors I used and one on the idea behind the process. The model sparked an idea and I'm trying to expand on it in the coming weeks. I don't want to overload folks with color theory posts, but I think some of it is pretty interesting stuff. Especially when it makes painting quicker and easier. I have a bunch of zombies that I'm now going to have to convert, thanks to you! Stop inspiring me! Thanks guys! Once I get some free time, I'll build the remaining members of the squad and then post some pics of the whole unit. Looks great as always. It is really nice to see you painting some models without power armour! I like his simple, clean (yet dirty) conversion and paint job Ron. I really like it. I really don't like the new site look though! Gorgeous work as always Ron! Wondering if green eye lenses might work better maybe? I too was excited for the Cultists in the new book, its about time we take a step back towards the old Lost and the Damned list out of the Eye of Terror book!